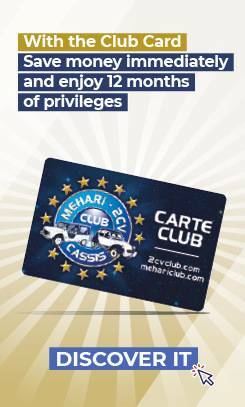 Each order only becomes effective upon receipt of payment for it, by credit card (Visa, Eurocard, Mastercard), by bank cheque (account domiciled in France only) or postal cheque payable to the company 2CV MEHARI CLUB CASSIS, by transfer, or by money order. Only payments by credit card (Visa, Eurocard, Mastercard), bank transfer or Paypal are accepted from international customers. Ownership of invoiced goods is retained by the seller until full payment of the price (French Law 80 335 of 12/05/1980). Regardless of the delivery method, goods travel at the recipient's risk. Thus, it is the recipient’s responsibility to exercise the recourse stated in the “Acceptance” section on the delivery form. The return of consignments is the customer's responsibility. Every claim of non-compliance, oversight or breakage on handover by the shipment carrier must be noted on the delivery form and sent to 2CV MEHARI CLUB CASSIS with a copy of the reservations reported to the carrier, within 48 hours following the signature of the delivery form. Complaints cannot be accepted if these conditions are not met. In such cases, all liability is incumbent on the customer. Orders are subject to the packaging and delivery costs stated at the time of acceptance of the order, and form an integral part of it. 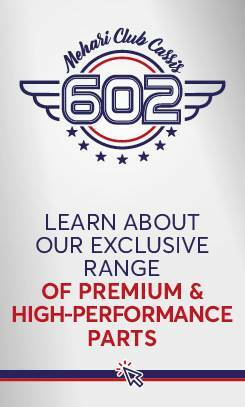 Delivery charges may be waived during promotions or under certain conditions. 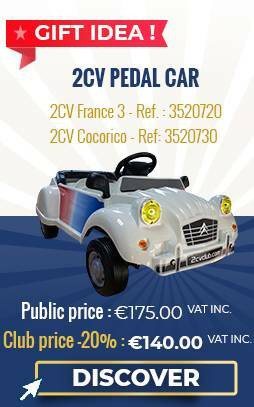 Free delivery for the first two orders, with the exception of outsize parts: €30 inc. VAT for platforms, hoods/bonnets and front wings; €50 inc. VAT for Méhari bodywork bottoms (shipment of 2CV bodies and trailers subject to cost estimate). From the third order, free shipping is granted for all orders exceeding €100 inc. VAT (excluding packaging costs). Delivery costs do not include packaging costs, which remain payable. The 2CV MEHARI CLUB CASSIS undertakes to make every effort to deliver its products as soon as possible. In the event of a delivery delay, no discount or damages will be payable to the customer. The prices stated on our websites and in our catalogues include VAT (20% or 10% VAT) and are in euros. They are stated for information only, and may be changed without notice. Prices invoiced are those prices applicable on the day of ordering. The above conditions are deemed to be accepted de facto without restriction or reservation by the very fact of the conclusion of a sale, notwithstanding any contrary clause printed or handwritten on our customers’ purchase orders. In the event of a dispute, the Court of Marseilles will have sole jurisdiction, even in the case of a warranty claim or multiple defendants. The photos and illustrations on our website are for information only, and do not bind our company in any way. The provision of a European Community VAT number is mandatory to be able to have a professional account with the 2CV MEHARI CLUB CASSIS, with the exception of professionals outside of the European Union. You have the option of requesting a return within 14 days after reception of your order (365 days for Club card holders). You can return one or more parts, or even your entire order, in order to receive a refund. If you want to undertake a return or replacement of parts, or want to ask for a refund, it is essential to contact the After-Sales Service beforehand (by phone on +33 (0)442 010 768, or by email to sav@mehariclub.com), before returning your parts, in order to obtain your parts return reference from 2CV MEHARI CLUB CASSIS. The return costs are payable by the customer.  Parts or accessories returned must be placed in a re-shipment box. The return form must be affixed to the package in a visible manner. If a parts kit is returned, all parts in the kit must be returned to qualify for replacement or refund. Heavy or fragile parts must be stowed so that the entire consignment is properly immobilized and suffers no damage during shipment. For a replacement: Articles are replaced with similar items having an identical designation, and according to stock availability. If replacement proves impossible, we will provide a refund for the product. In the case of a replacement due to a product defect, an assessment of the item in question is undertaken by our staff before proceeding with a standard replacement or a refund. For a refund: upon reception of your package, you will be contacted by our After-Sales Service, which will offer you a credit or a refund. The credit or refund will be available within an average of 21 days after reception of the part in our warehouses. Exception to the right of withdrawal: The exercise of the right of withdrawal is excluded for goods made specifically according to specifications provided by the customer or that are evidently personalized (example: registration plates, special paint or upholstery, etc.). All our parts are guaranteed for 1 year (unless otherwise stated). Labour and shipment costs to return parts to 2CV MEHARI CLUB CASSIS are payable by the customer. If the warranty coverage is accepted, shipment costs will be refunded on the basis of the Post Office second-class rate. 2CV MEHARI CLUB CASSIS reserves the right to accept or refuse warranty coverage if parts are not fitted according to the provided instructions and in accordance with accepted working practices. No warranty claim will be accepted without prior return of the part concerned. Purchase and replacement of the original breather (the purchase of the breather must be in the same invoice as that of the standard replacement engine, and on the same date). Strict compliance with the assembly instructions (see page 8 of the documentation supplied with the engine). The coverage does not include labour for removing and refitting the engine unless the work was done in our workshops or you have taken up the engine Serenity Coverage option. Purchase of the commissioning kit (the purchase of the commissioning kit must be in the same invoice as that of the standard replacement engine, and on the same date). Replacement of the original breather. Replacement of the recycling hoses. Replacement of the air filter cartridge. Replacement of the oil pressure switch. These coverages will not be extended in any circumstances. It is advisable to have a standard replacement engine fitted, or at least to have the adjustments checked by a specialist. In case of problem, immediately contact our After-Sales Service on +33(0) 442 010 768, which will advise you - depending on the seriousness of the facts established - either to return the engine or whatever other part for assessment, or to turn to a repairer under our responsibility, so as to avoid removal of the engine. The coverage is limited to the replacement of parts of our manufacturing recognized as being defective by our After-Sales Service, or refurbishment, at our convenience and without obligation regarding the time required, without us having to share in any way the costs of deprivation of use of the vehicle and the consequences of accidents of any nature involving persons or things. After assessment at our workshops, and if replacement of the engine is necessary, the delivery costs will be borne by our company, and the warranty will be extended. The labour costs for the repair or replacement of our engines will only be paid for if the work was done in our workshops and the Serenity Coverage option has been selected. Consumables and servicing will not be covered. Repair, even partial, without our prior agreement. 1,000 km servicing not done by a professionally recognized service provider. Sale of the vehicle having led to a change of ownership. Defective fitting or adjustment of the engine. Motor removed and returned without our agreement or incomplete. Engine usage not covered by the manufacturer (competition or industrial engine). Damage resulting from a malfunction of the peripheral components. The initial engine installation must be done by a 2CV MEHARI CLUB CASSIS, distributor, a 2CV MEHARI CLUB CASSIS-approved partner, or an automotive professional. The provided assembly instructions provided must be followed. The removal and installation of the engine under warranty must be carried out by the same professional, subject to approval by the 2CV MEHARI CLUB CASSIS of its cost estimate for the work. Towing and travelling expenses remain payable by the customer.